I have signed up for Amazon Web Service to use Amazon SES. 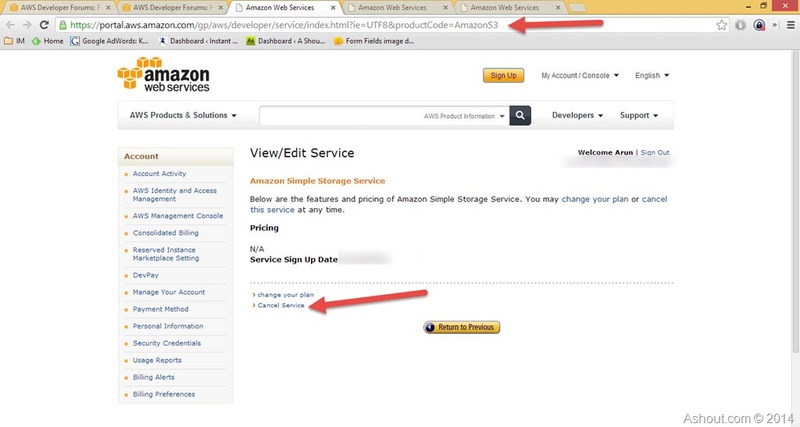 Once I decided to try Amazon Simple Storage Service (Amazon S3) to keep the backup of my blog, and created bucket and after few hours I decided this service is not for me so I deleted that Amazon S3 bucket and I thought I cancelled that service. No, I was wrong. Deleting Amazon s3 bucket won’t close your Amazon s3 account. You still be charged for that service. Same thing happened to me. I just deleted my files inside that s3 bucket and folder as well, thinking that this will stop from charging for this service. When I logged to check my previous month bills, I was shocked to see that I have been charged for using Amazon s3 account. I thought they might have charged for using 2 days, and I left that matter there itself. Again when I logged-in this month same thing happened! I was again charged for using Amazon S3 which I’m not using. After seeing billing I contacted their support team regarding this, and they said they will refund my money, and without understanding my question properly they suggested me to close my complete Amazon web service account. But I was not looking for my refund or to close my complete amazon web service account. I just need to stop charging recurring fee for using Amazon simple storage service. After this replay I went to their forum to search solution for this problem and finally I found my answer. Lot of users saying we need to visit Account Activity page to cancel any service. But I didn’t find any such option on this page. And few other users said visit Manage Your Account page to cancel amazon web service. Here I find a link to cancel my complete Amazon Web Service Account (AWS) and also got an option to Cancel Selected Services. But when I click the dropdown menu I didn’t get any option to select service, so this option also won’t worked for me. In this page you will see the link “Cancel Service” at the bottom of the page. Click on that link. 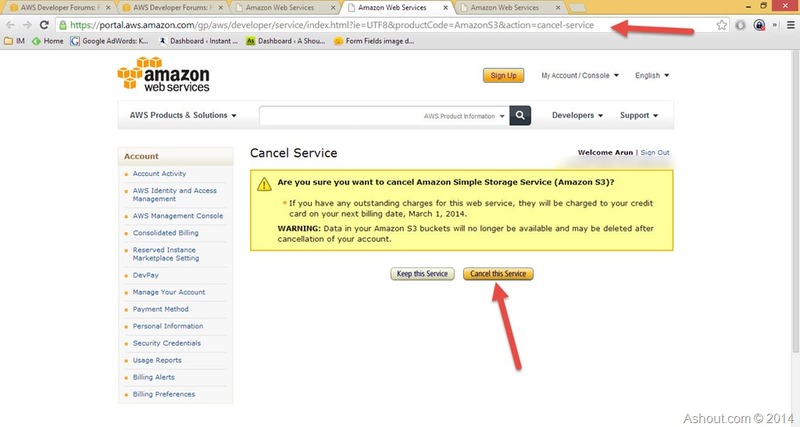 In the next page you will asked for confirmation, to cancel Amazon S3 again click on “Cancel this Service” button. That’s it. Now we have cancelled our Amazon Simple Storage Service (Amazon S3). To verify cancellation, you can visiting Manage Your Account page. There you will see “Amazon Simple Storage Service (S3)” under Services You’re Not Signed Up For option. Thanks a lot man !! life saver. Spent hours to do this. urs just helped me in less than a minute !